You love Berlin. We do too! Berlin is booming. Berlin is hip, multifaceted, trendy, zeitgeisty. In order to provide the capital of the future with energy and to inspire people from all over the world for Berlin, fresh ideas and projects are needed that surprise and attract people. And it needs entrepreneurs and companies who support new ideas as change makers, designers, friends and fans. Wanted are Berlin-friends with a vision, who want to create change. Are you one of them? Then you should join us. Friends of Berlin International - a new network for Berlin. We promote ideas. With passion! Friends of Berlin connects Berlin and friends of the city, artists and art patrons from all over the world. Our focus lies on art and intercultural exchange, on the promotion of artists and international art projects. Together, we have created a platform to bring innovative ideas and formats to Berlin that inspires and invites to visit Berlin. With our vision, we want to motivate friends of Berlin from all over the world to become part of the Friends of Berlin community. Friends of Berlin International – a new network for Berlin. The beginning was designed in 2017, shortly after the club was founded. With great art, charisma and brilliance! The first project of the Friends of Berlin immediately caused a sensation. 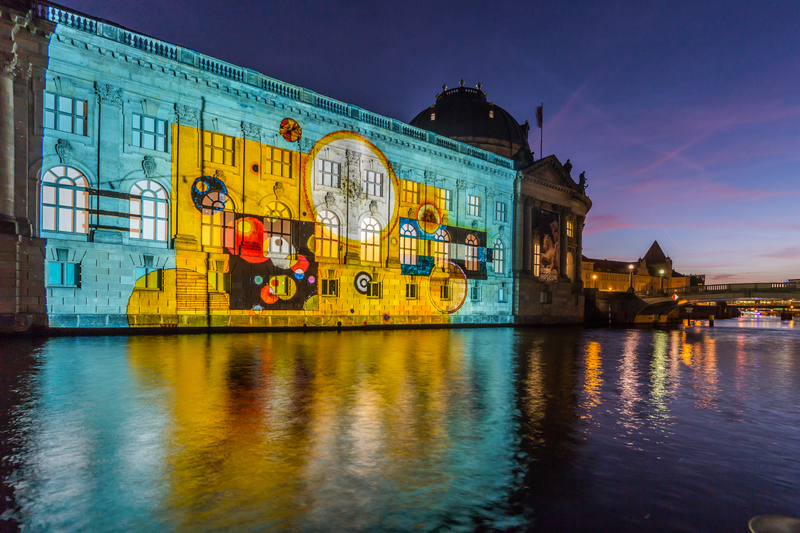 We have succeeded in bringing world-famous works of art from New York's MoMA to Berlin with spectacular projections as part of the Berlin Festival of Lights! On the beautiful terrace of the Monbijoupark, thousands of festival visitors as well as strolling passers-by stopped by, admired and enjoyed the masterpieces in light art format on the back of the Bode Museum. 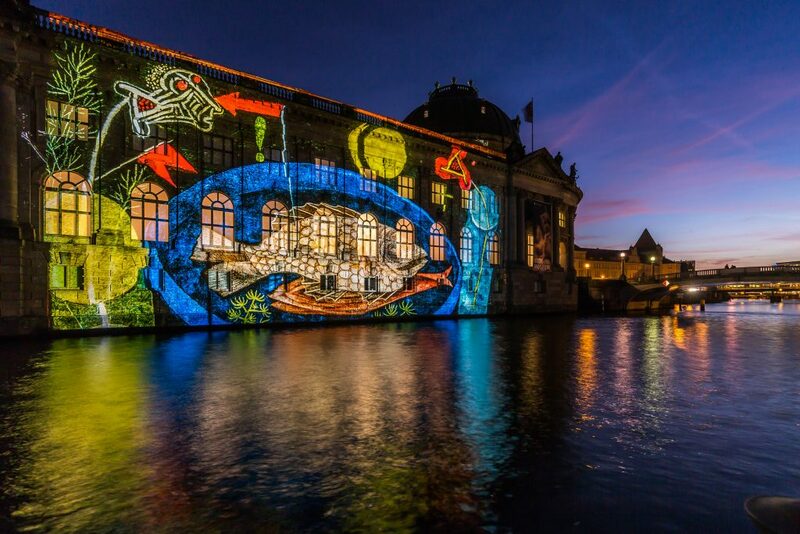 In October 2018 we could win the venerable "Alte Nationalgalerie" as a spectacular projection facade for one of the most famous paintings by Paul Gauguin, the "Tahitian fisherwomen". Thanks to our club member, the Museum & Location Veranstaltungsgesellschaft of the Staatliche Museen zu Berlin mbH, this project became possible. The directly opposite James Simon Park became one of the most popular meeting places on every festival evening. Countless visitors admired the unique atmosphere and the breathtaking view on the Museum Island. The staging of the façade and the colonnade became one of the most photographed motifs of the entire festival. 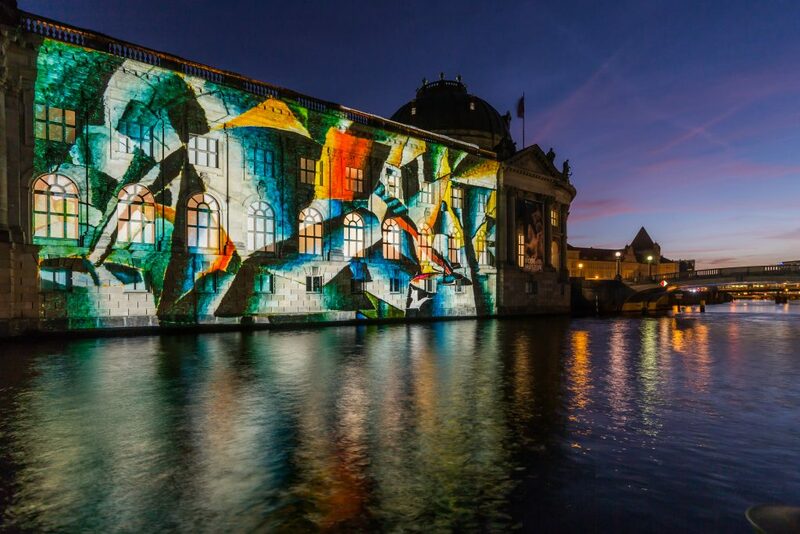 To promote Berlin as a center of attraction through unique, innovative projects. To develop new, attractive concepts for Berlin’s tourism industry and intercultural dialogue. 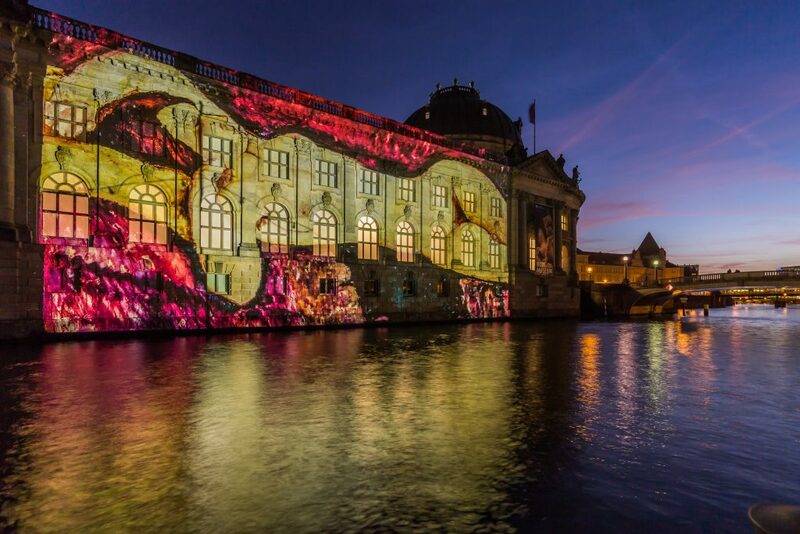 To bring international art projects to Berlin. To promote Berlin artists and make them internationally established. 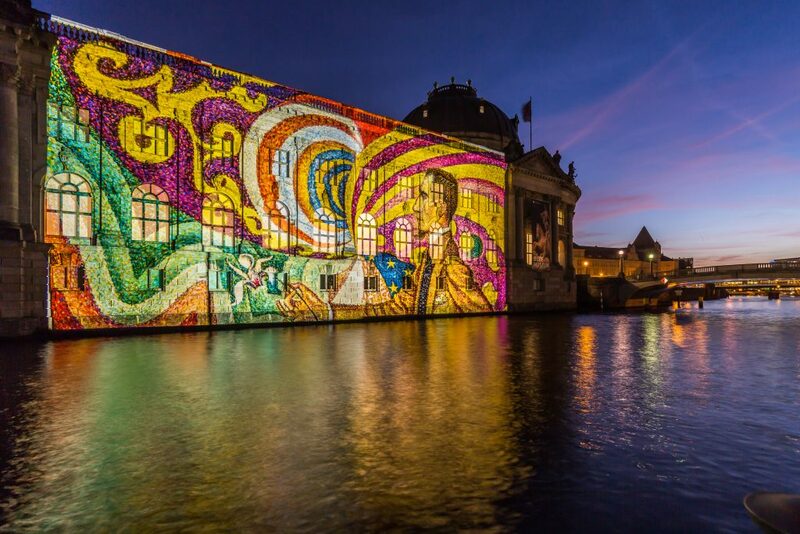 To promote tourism companies in Berlin by implementing international event highlights. 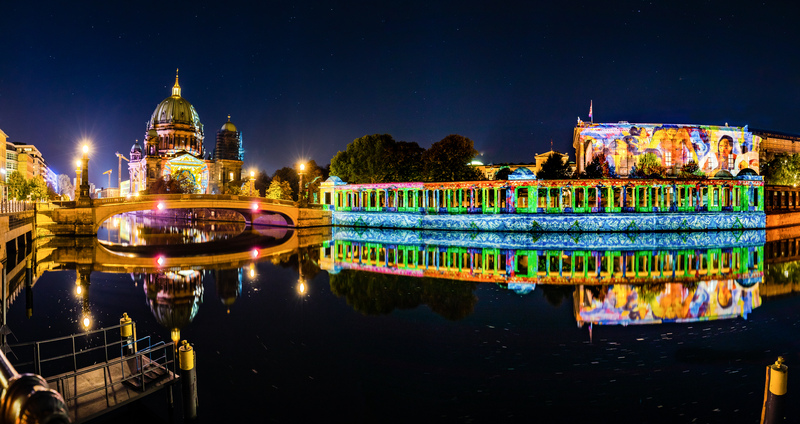 To design new structures to strengthen Berlin's tourism industry. To bring dedicated personalities together as “Friends of Berlin" and unify existing forces. To gain different supporters as members in order to create a diverse room for exchange. To expand the Friends of Berlin as an internationally active network with creative diversity. More than one member. Co! You want to become a friend and join us? 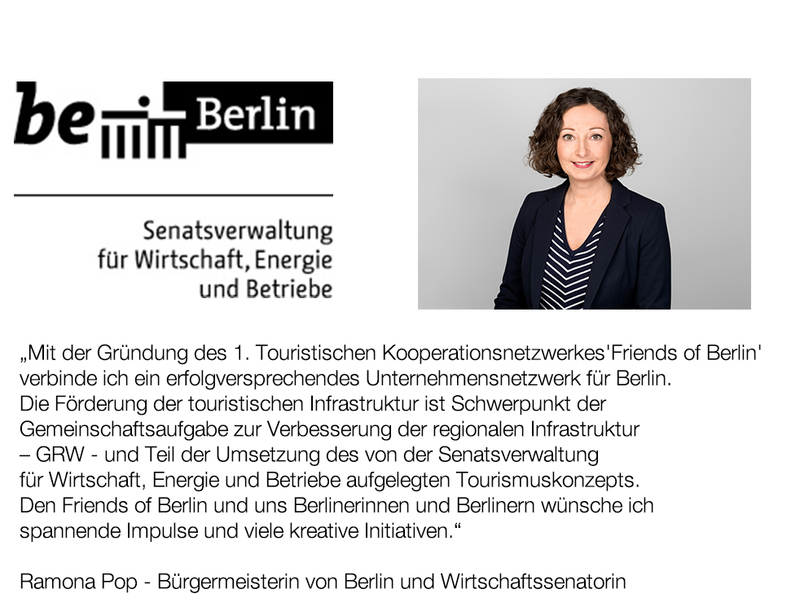 I represent a company in Berlin and would like to promote the area of tourism and culture as an important economic factor for Berlin and become a full member: Please click here! 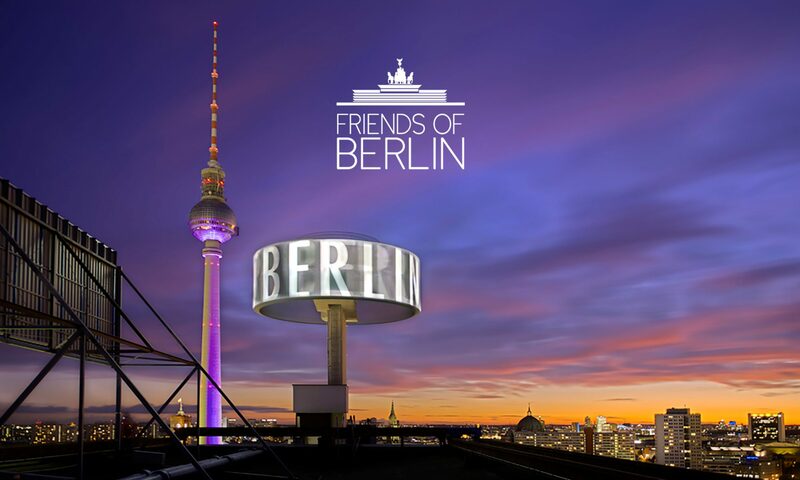 I am interested in supporting the Friends of Berlin as a Supporting Member: Please click here! I would like to support the Friends of Berlin as a sponsoring member or ambassador: Please click here! I love Berlin, do not represent a company and want to be included in the "Berlin Hall of Fame": Please click here! Verband der Berliner Stadtführer (Association of the Berlin Tourist Guides), Berlin Guide e.V. This project is funded by the Senate Department for Economics, Energy and Enterprises, with funds from the joint task "Improvement of Regional Economic Structure" (GRW). The funding consists of half state and half federal funds.